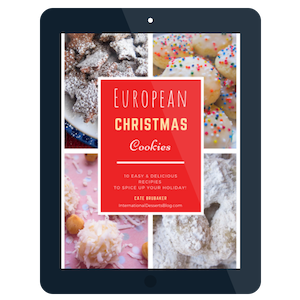 Christmas is less than a week away and I’ve still got 3 holiday desserts to share with you! 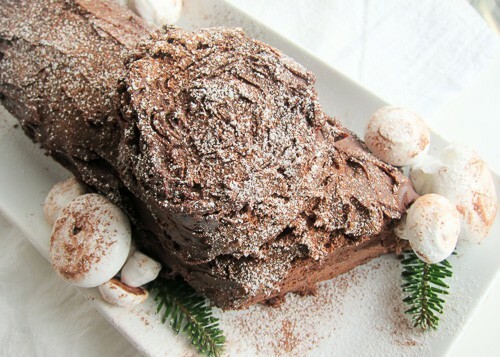 Today’s recipe and tutorial is Bûche de Noël. Later this week I’ve got recipes for German Gebrannte Mandeln (cinnamon sugar almonds) and German Stollen (christmas bread). All three recipes are easy and delicious! 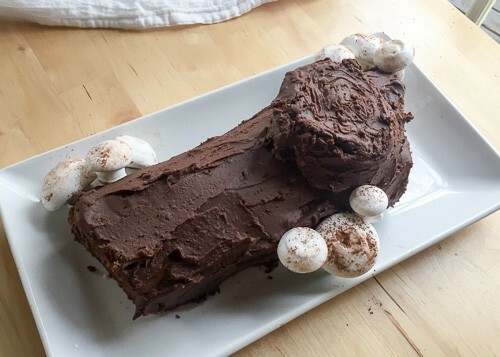 Bûche de Noël (Yule Log) is my kind of dessert. It’s is a beautiful French Christmas cake that looks impressive but is actually very easy to make. 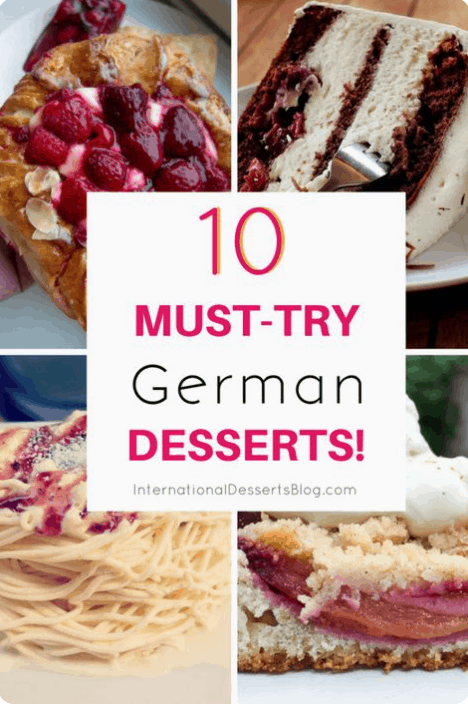 You can simply make a cream-filled cake and dust the top with powdered sugar or add chocolate ganache icing and decorations. I’ve made made Bûche de Noël before but I’ve never made meringue mushrooms, so I decided to give it a try. It’s worth the effort because they add such a nice touch to the cake. 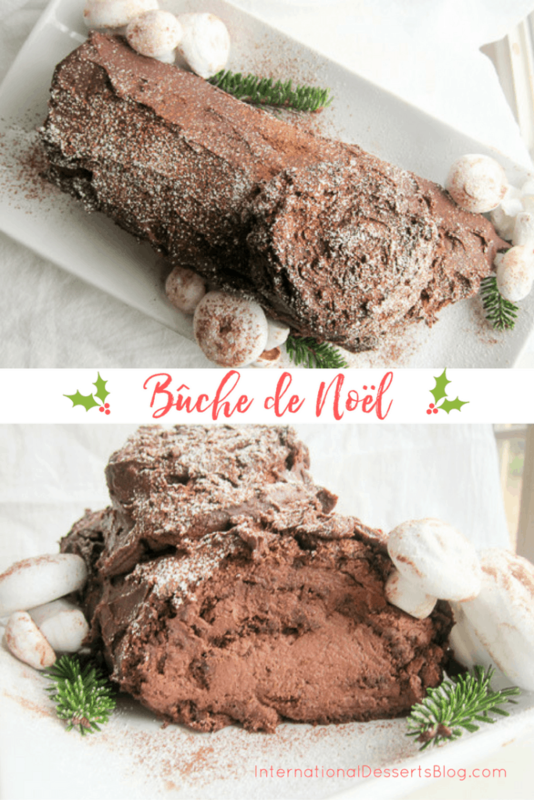 Bûche de Noël is easy but there are several steps, so I created a tutorial. Scroll down for the full recipe. And if you’re looking for Bûche de Noël decorating inspiration, take a look at my Bûche de Noël Pinterest board. 1.7 Move Over Sugar Cookies! Since the meringue mushrooms need time to dry, I recommend making them 12-24 hours before you want to serve your Bûche de Noël. 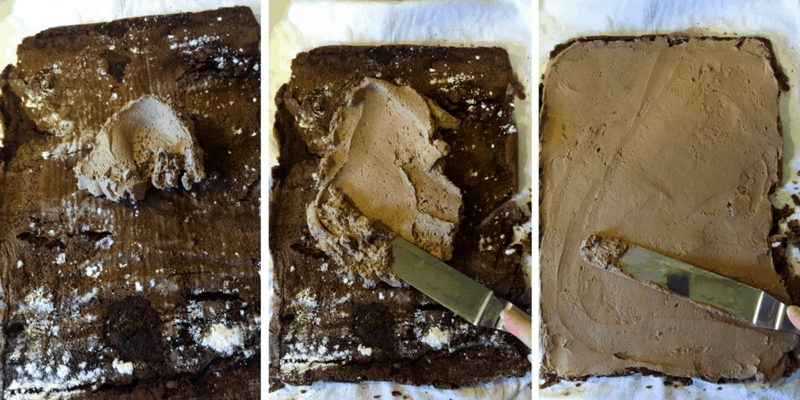 You can prepare the mushrooms, cake, filling, and ganache a day (or more) in advance, and then assemble the cake the day you want to serve it. 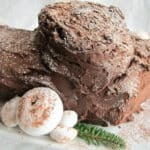 I was always impressed by bakers who added meringue mushrooms to their Bûche de Noël and I had no idea, until just this week, how easy it is to make them! To make the meringue mushrooms, separate 3 eggs and let the egg whites warm to room temperature. Then beat the egg whites on low until they form soft peaks. I used my stand mixer for this (whisk attachment) but a hand mixer will work just fine. 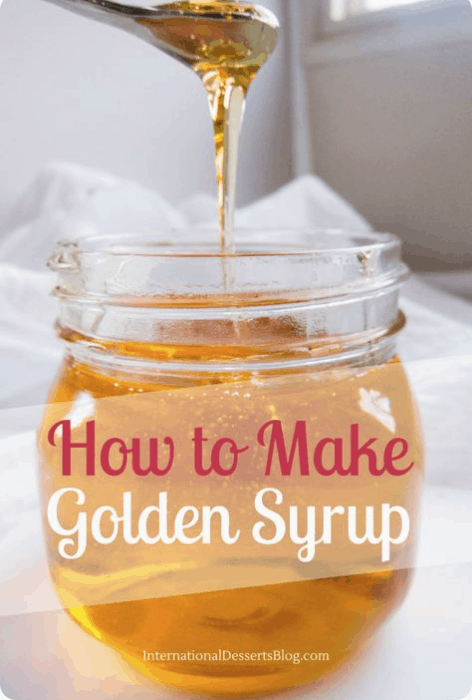 Increase to high speed and slowly add 3/4 cup sugar until dissolved. When the egg whites are glossy and form stiff peaks, it’s ready. 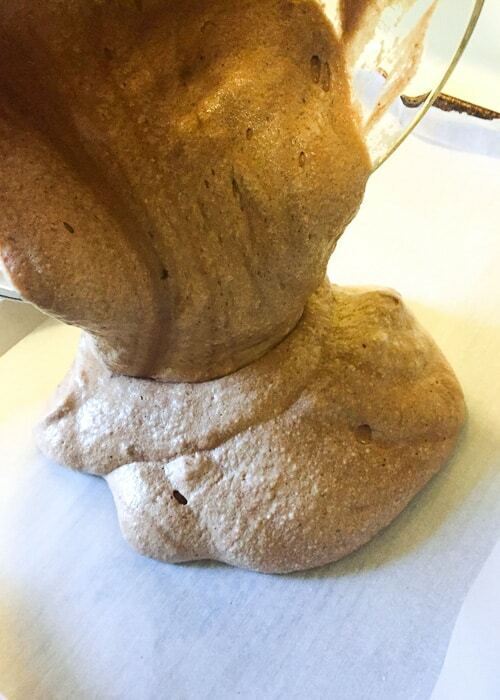 Now you want to fill a pastry bag with the meringue. I used a plastic pastry bag and with a bit of the end snipped off instead of using a metal piping tip. That way I could just throw away the entire bag without having to fish out the tip. Don’t have a pastry bag on hand? Fill a sandwich-sized ziplock bag with meringue and cut a bit off one corner. 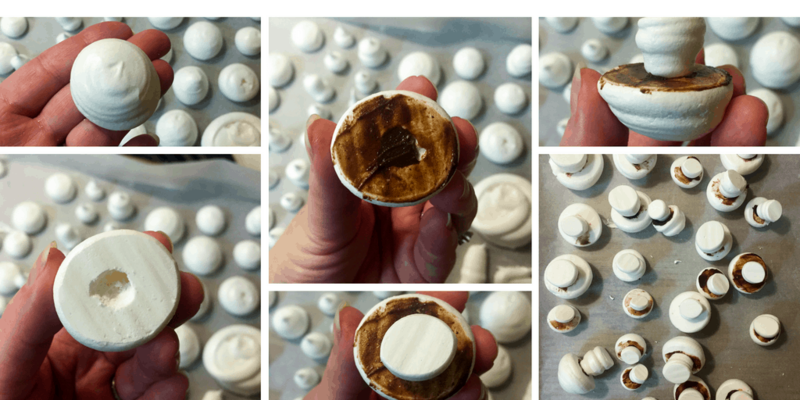 Place parchment paper on a baking sheet and then start piping mushroom tops and stems! 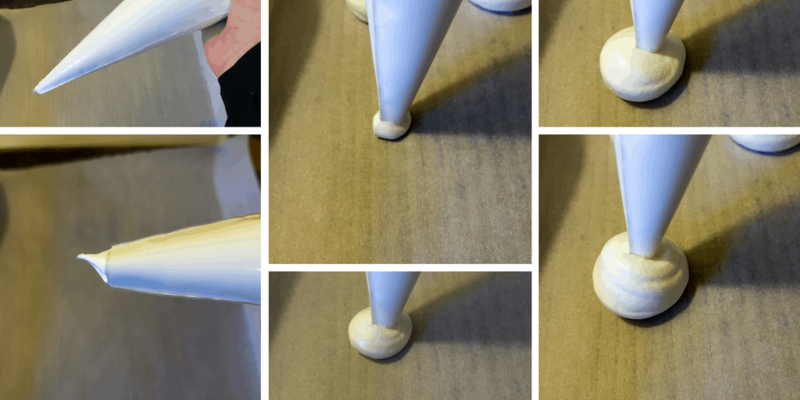 Just point your pastry bag straight down and apply even pressure as you slowly lift the bag upwards. Do the same type of thing for the stems, but lift the pasty bag more quickly to get a thinner column. Try a few and if you don’t like the way they look, scrape the meringue off the parchment paper and start over! I made mushroom tops and stems of various sizes, which also allowed for a little experimentation. Make more than you think you’ll need because meringue is delicate and some are sure to break. Be sure to keep any left-over meringue because I’ve got a post-Christmas recipe that will use them up in a very delicious way! You probably noticed that the tops are all pointy. Not very mushroom-like, right? It’s easy to fix. Just dip your finger in a little water and smooth down the tops. 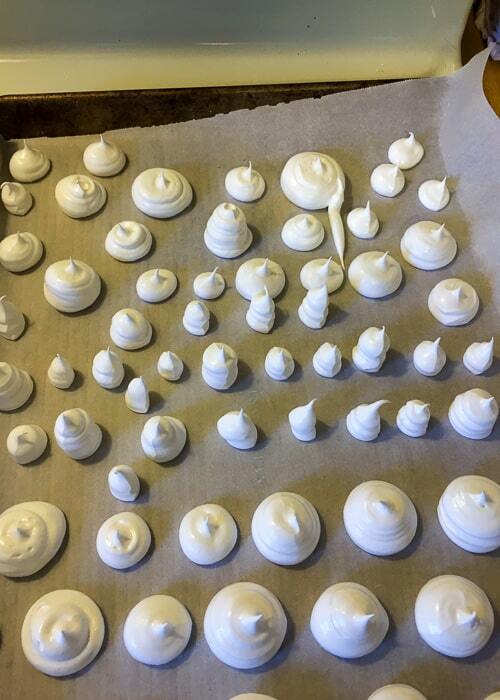 Now it’s time to bake the meringue. Pop the cookie sheet into a 200 F oven for 1 1/4 to 1 1/2 hours. 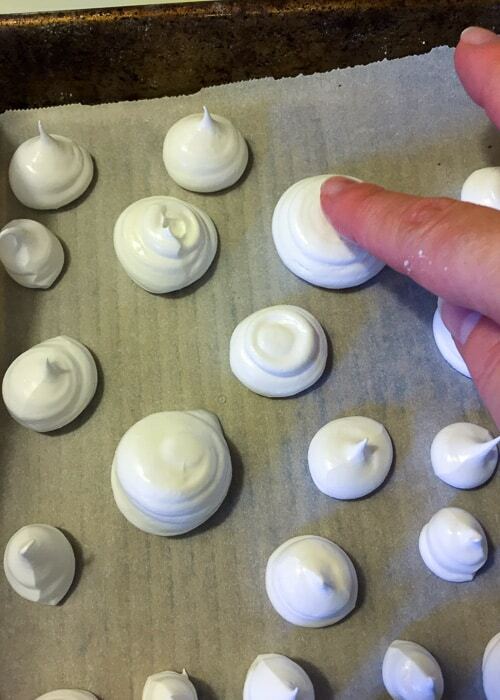 They’re done when you can easily lift a piece of meringue off the parchment. At this point, turn off the oven, open the door slightly, and let the meringue mushrooms sit for at least a couple hours (overnight is ideal). This will allow the meringue to dry. This is the “glue” that holds the mushroom tops and stems together, and what you’ll use to frost the cake. It needs to cool for an hour or two, so make it while the meringue is baking. Pour 1 cup chocolate pieces (I used semi-sweet chocolate chips) into a mixing bow. Heat 1 cup heavy cream on the stove until it starts to bubble around the sides. 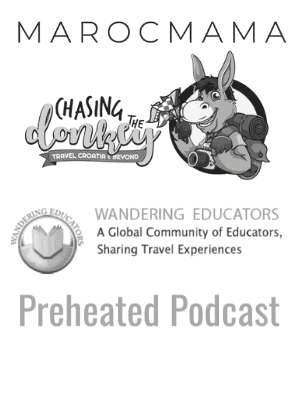 Take it off the heat and let it cool for a few minutes. Then pour the warm cream over the chocolate and stir until chocolate is melted. Chill in the fridge until spreadable. 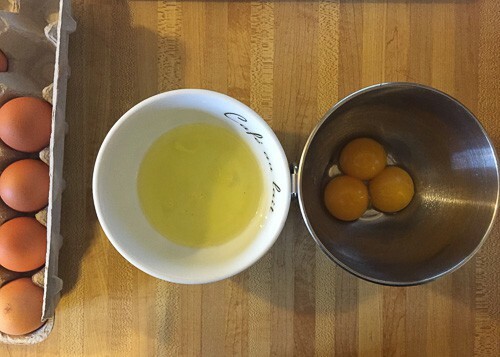 Separate 6 eggs, then beat the egg yolks with 1/2 cup sugar until light yellow. 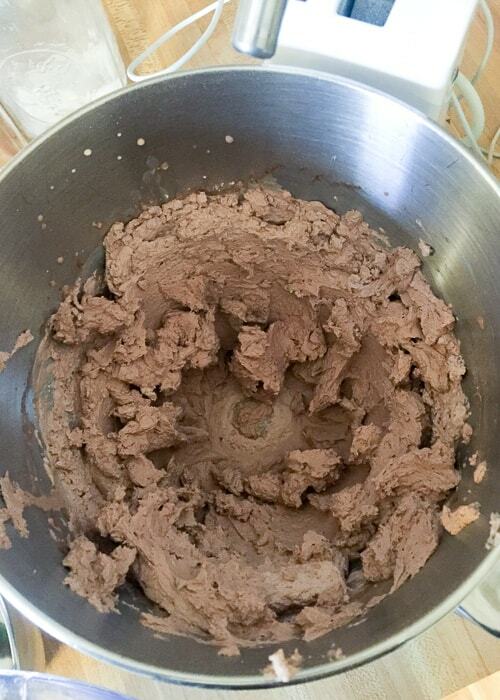 Add 1/3 cup unsweetened cocoa powder and mix. 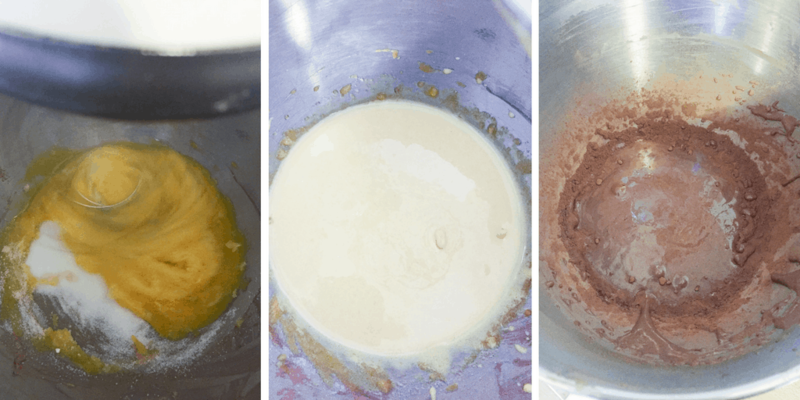 Clean the mixing bowl, then and add the egg whites. Beat on low, adding 1/4 cup sugar a little at the time, until the mixture forms stiff peaks. 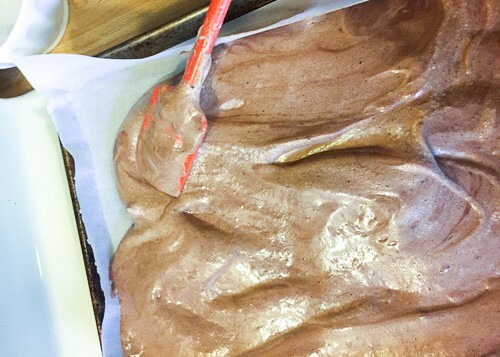 Immediately fold the whipped egg whites into the chocolate mixture. 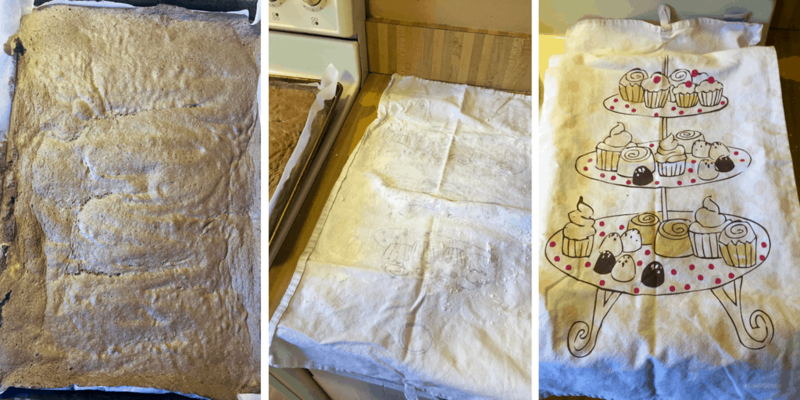 Line a 10 x 15 jelly roll pan with parchment paper. Pour the cake batter in the pan. Spread the batter around with a spatula until evenly distributed. Bake for 12-15 minutes or until cake springs back when you touch it. When the cake is finished, sprinkle a clean towel with powdered sugar, then place over the cake, sugared side down. Then turn the cake over onto the towel and take off the baking sheet. 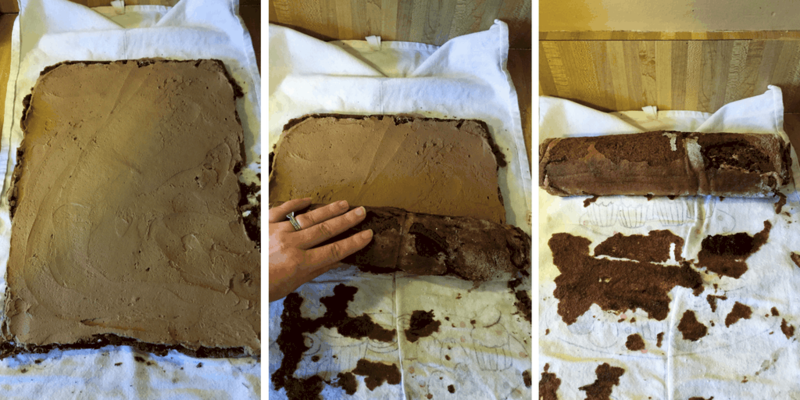 Carefully peel off the parchment paper (do this slowly and carefully – I lost some of my cake during this step!). Sprinkle the cake with a little more powdered sugar. Carefully roll up the cake in the towel. This will allow you to later re-roll the cake with the filling inside without it breaking apart. Let cake cool for 30 minutes. 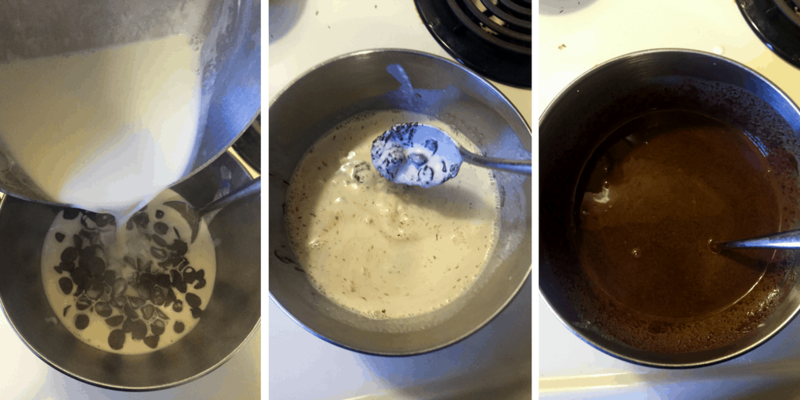 Beat 2 cups heavy cream, 1 tsp vanilla extract, 1/2 cup powdered sugar, and 1/2 cup cocoa powder in a mixing bowl on high until the cream forms stiff peaks. If you’d prefer vanilla filling, leave out the cocoa powder. 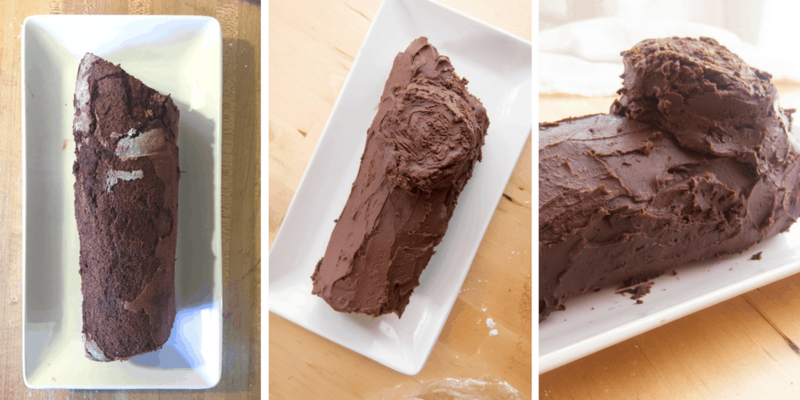 Cover with plastic wrap and chill in the fridge until you’re ready to spread it on the cake. Put the mushroom tops to one side and the stems to the other. Take a top and use a paring knife to make a hole in the middle of under side of the mushroom top. Place a small amount of chocolate ganache in the hole. Place a stem into the hole filled with ganache. Let mushrooms dry on a cookie sheet. This is the fun part! 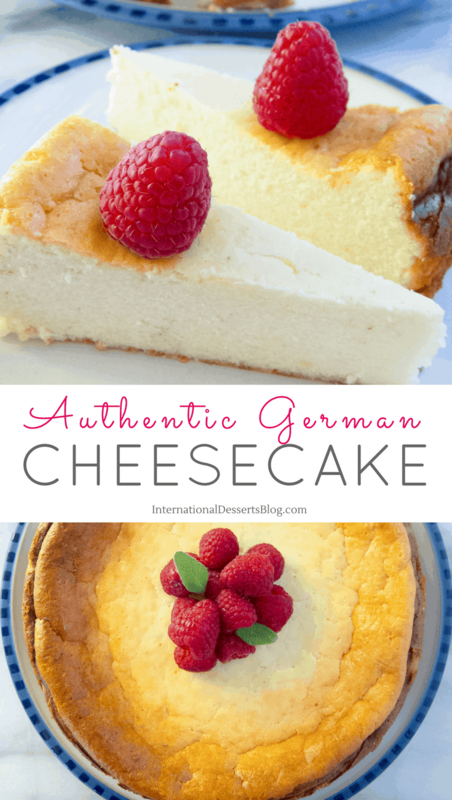 Grab the whipped cream filling and spread it on the cake with an off-set spatula. Carefully roll up the cake. Transfer to a serving plate. (I put two sheets of waxed paper underneath to keep the serving plate clean.) Slice a small portion of end of the log at a diagonal. Keep this because you’ll use it to create a “knot” on the log. 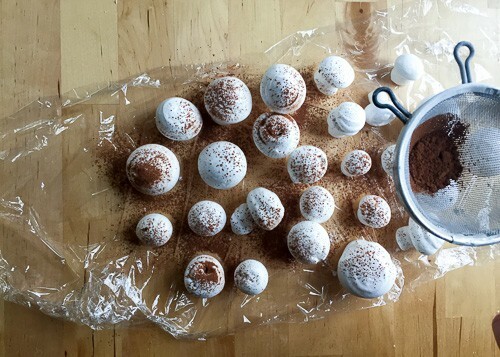 Get out your meringue mushrooms and cocoa powder. Dust the tops of the mushrooms with cocoa powder. I smoothed out the cocoa powder on the tops of some of the mushrooms for a varied look. Once you’re happy with your mushrooms, place them on and around your cake. Then dust the top of the cake with a bit of powdered sugar and then cocoa powder. Add any other embellishments you want! I snipped a few pieces off my Christmas tree, washed them with dish soap, and stuck them under the mushrooms. 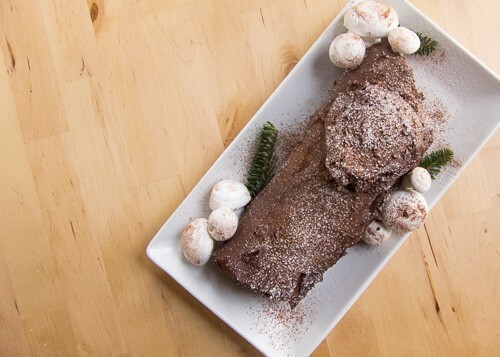 Enjoy the oohs and ahs you’ll get when you serve your Bûche de Noël! This French Christmas cake looks impressive and tastes delicious but it quite simple to make. Pour chocolate pieces (I used semi-sweet chocolate chips) into a mixing bow. Heat heavy cream on the stove until it starts to bubble around the sides. Take it off the heat and let it cool for a minute. Pour the warm cream over the chocolate and stir until chocolate is melted. Chill ganache in the fridge until spreadable. Separate eggs. Let egg whites come to room temperature. 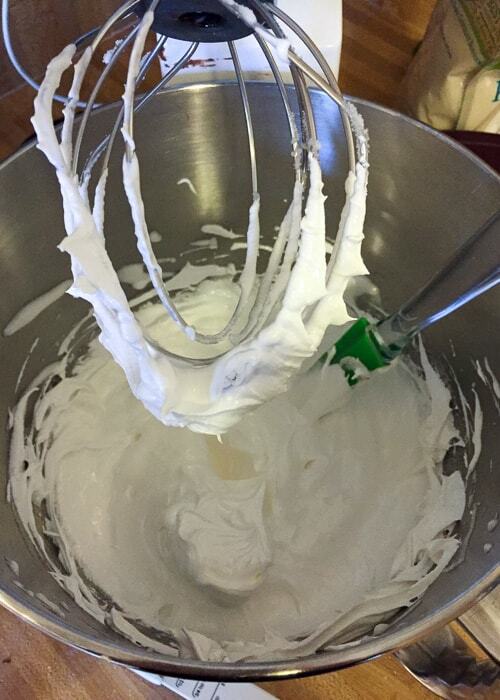 Using a stand mixer, beat the egg whites (using the whisk attachment) and cream of tarter on low to soft peaks. Increase speed to high. Add sugar little by little until dissolved and the egg whites form stiff peaks. 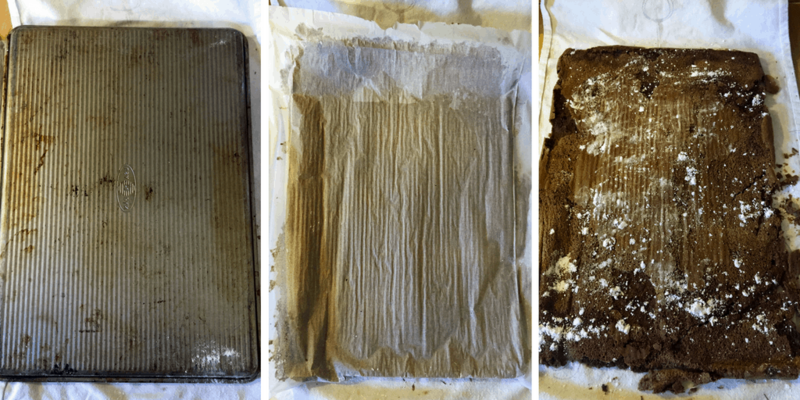 Line a baking tray with parchment paper. 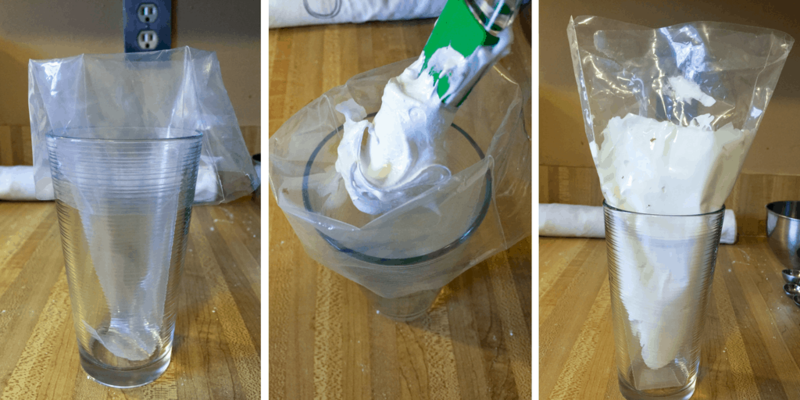 Fill a pastry bag with the whipped egg whites. Pipe mushroom tops and stems onto the parchment paper (see photos above). You can smooth out the mushroom tops using your finger and a bit of water. Place in oven and bake for 1 1/4 to 1 1/2 hours or until you can easily lift the meringue from the parchment. Turn off oven, leave the door slightly ajar, and let the meringue sit for at least a couple hours (ideally overnight). To assemble the mushrooms, use a sharp paring knife to make a hole in the center of the underside of a mushroom top (scoop out a little). Fill hole with a bit of chocolate ganache. Then place the mushroom top on a mushroom stem. Lay top side down on the parchment to allow the ganache to dry. Dust the mushroom tops with coco powder. Preheat oven to 375 F. Line a 10 x 15 inch jelly roll pan with parchment paper. Beat the egg yolks and 1/2 cup sugar until thick and light yellow. 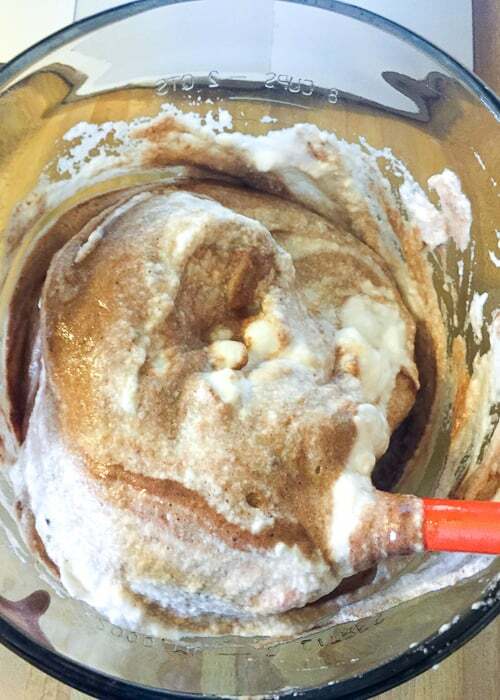 Mix in cocoa powder, salt, and vanilla. 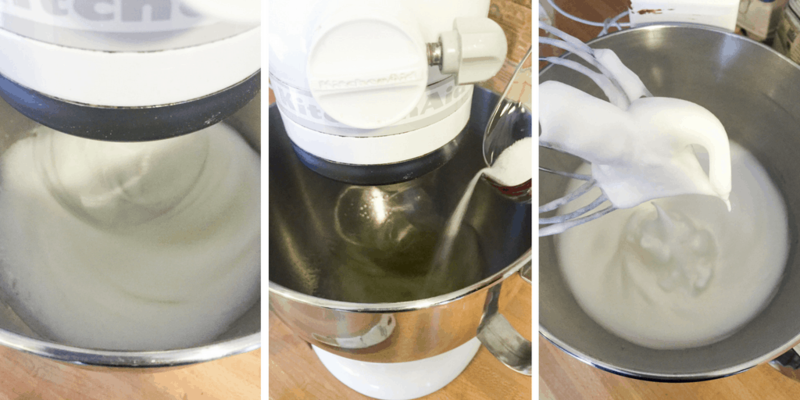 Clean the mixing bowl, then beat the egg whites to soft peaks. Slowly add the 1/4 cup sugar and beat to stiff peaks. 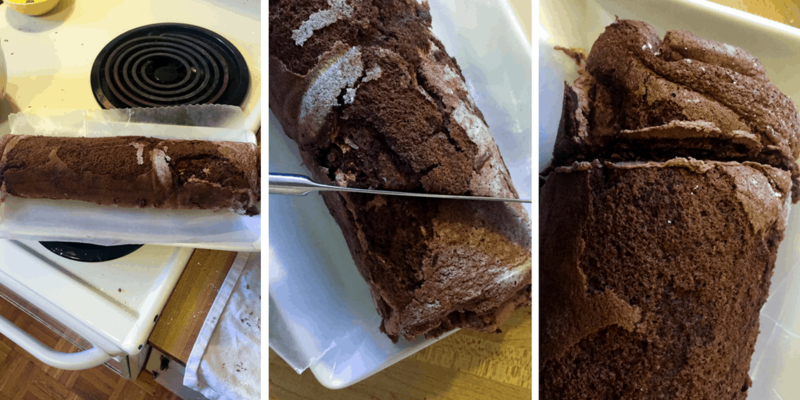 Fold egg whites into the chocolate mixture and pour onto a jelly roll pan lined with parchment paper. Spread evenly. Bake 12-15 minutes. The cake should spring back when touched. Sprinkle powdered sugar on a clean towel, then place towel over cake, sugared side down. 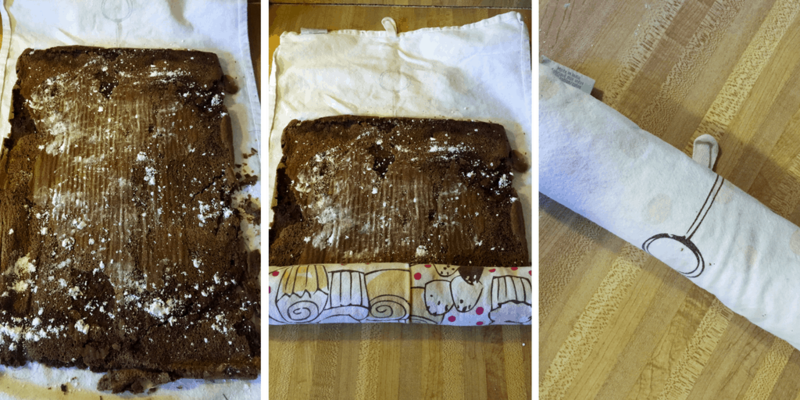 Turn jelly roll pan over so the top of the cake is resting on the towel. Remove the pan, then carefully peel off parchment paper. Dust the exposed cake with powdered sugar. Carefully roll up the cake in the towel. Let cool for 30 minutes. 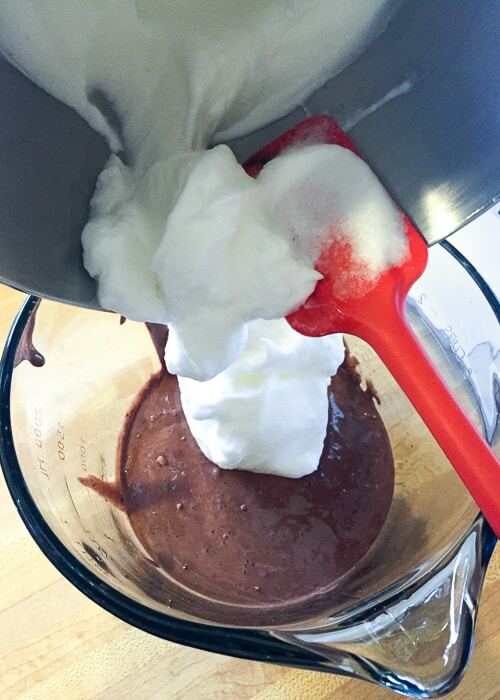 Beat heavy cream, vanilla, and cocoa powder to stiff peaks. Cover with plastic wrap and store in the fridge. 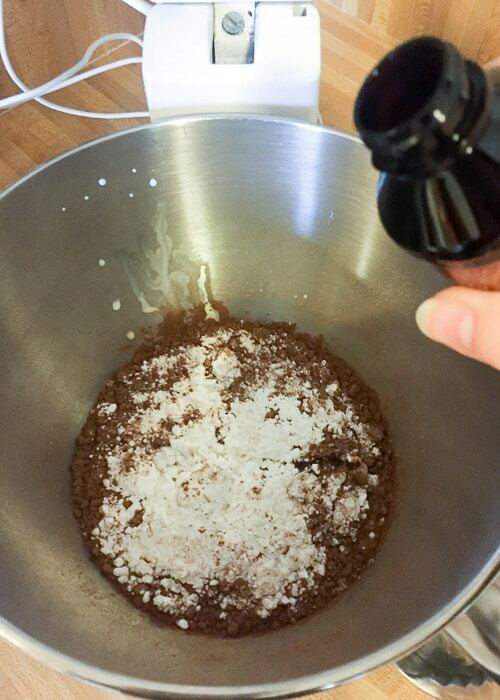 If you prefer vanilla filling instead of chocolate, omit the cocoa powder. Unroll the cake and spread the whipped cream filling over entire inside. Gently re-roll the cake and place on a serving dish. Cut a small section off the end of the log at a diagonal. Save this piece to make a "knot" on the top of the log. 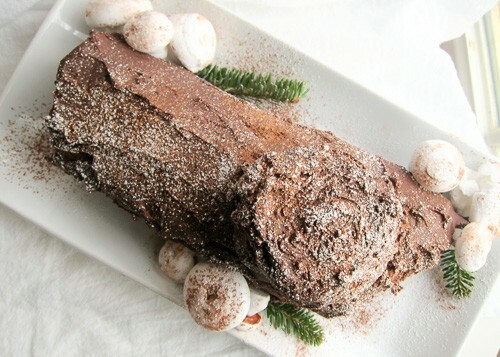 Frost the log with the chocolate ganache (you may need to let it warm up a bit so it's easy to spread). 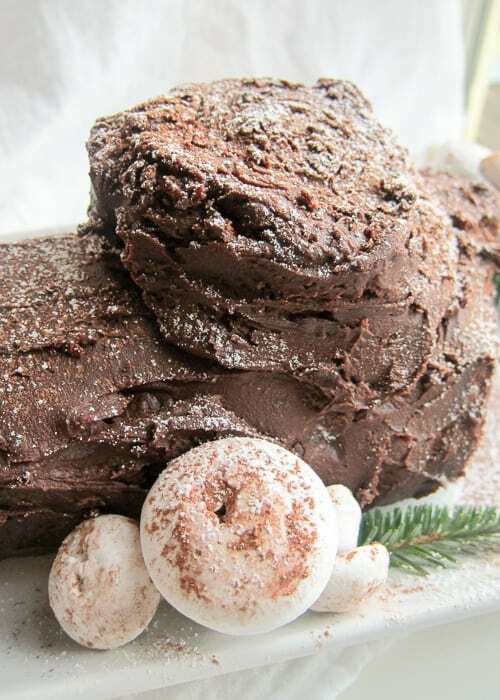 Place the cut piece of cake on the top of the log and frost with the ganache. Place the mushrooms on and around the cake, adding additional embellishments as you wish. 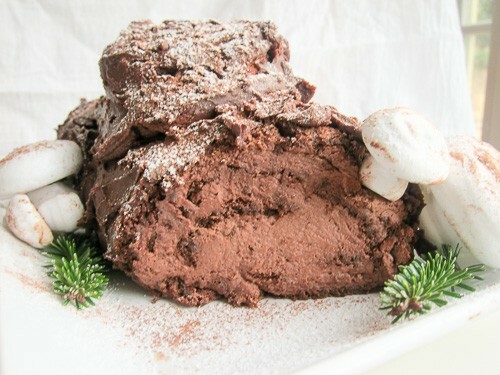 Sift powdered sugar and then cocoa powder of the top of the log.